Low Chair (stainless & rope): Following the success of their Low Chair (walnut / leather), the In House designers, Mark Zuckerman and Monty Lawton, are now introducing the chair for outdoor applications. The Low Chair (stainless / rope) is exactly that - the same form beautifully crafted in different materials. 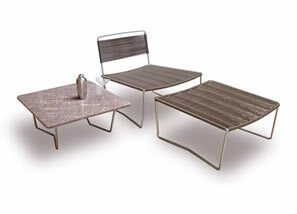 It has an exquisitely thin stainless steel (316) frame and the seat and back are hand woven nylon (marine grade) rope. The chair comes in white, black and bronze rope. The Low Chair / Stainless Steel and Rope is available from our online store.